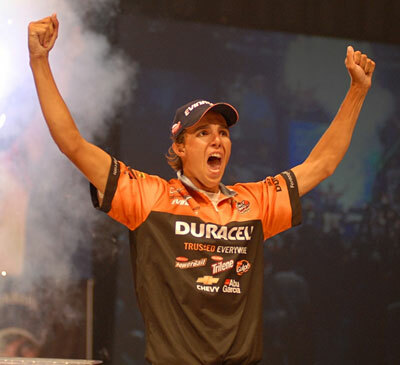 COLUMBIA, S.C. (Aug. 17, 2008) â€“ Team Duracell pro Michael Bennett of Lincoln, Calif., caught a two-day total of nine bass weighing 24 pounds, 15 ounces to win $1 million in the Forrest Wood Cup presented by BP and Castrol on Lake Murray on Sunday. Bennett is the youngest champion in the history of the Forrest Wood Cup and topped his closest rival, Team Kelloggâ€™s pro Dave Lefebre of Union City, Penn., by more than five pounds to become the sportâ€™s second instant millionaire. Bennett said he had a solid pattern targeted in practice, but heavy rains before the tournament began changed his approach. Bennett said he decided to start the tournament by fishing shallow. Bennett admitted to â€œjunk fishing,â€� or fishing without a pattern, although he said he fine tuned his approach to fit the situation. Bennett said he targeted clear, shallow water with a patient retrieve, but was not afraid to speed the retrieve if his method didnâ€™t produce. The last two days of competition Bennett said he refined his junk fishing and targeted specific midlake spots featuring structure or grass. Bennettâ€™s bait of choice for the week was a Snag Proof Fred Frog Custom Color. Bennett said Saturday he was nervous going into the last day of competition because he had run out of new water to fish and was going to have to repeat some water he had already covered. Bennett said he hadnâ€™t made plans for the $1 million first-place cash prize. He said he had more pressing things on his mind. Lefebre caught a two-day total of 10 bass weighing 19-12 to claim second place and $100,000. Lefebre said he could have made the event a lot closer than it was as he lost a five-pounder in the last few minutes of competition. Lefebre said he caught every fish he weighed in during the tournament on a 6-inch Berkley PowerBait Flippinâ€™Tail Worm. He rigged the worm with a 3/16-ounce weight and a 3/0 hook. â€œI just wanted one bait that would let me fish everything,â€� Lefebre said. â€œToday I was skipping it in the river around bushes and docks. Rounding out the top 10 pros were Terry Bolton of Jonesboro, Ark., (10 bass, 19-09, $75,000): Team Snickers pro Chris Baumgardner of Gastonia, N.C., (nine bass, 16-09, $60,000); Team Berkley pro Kevin Vida of Clare, Mich., (nine bass, 15-14, $50,000); Team Chevy pro Dion Hibdon of Stover, Mo., (eight bass, 13-08, $45,000); Team National Guard pro Brent Ehrler of Redlands, Calif., (seven bass, 13-03, $40,000); Brian Travis of Conover, N.C., (five bass, 11-01, $35,000); Mark Rose of Marion, Ark., (six bass, 10-00, $30,000) and Jay Yelas of Corvallis, Ore., (five bass, 6-10, $25,000). The field of 77 professional anglers consisted of qualifiers from the 2008 Walmart FLW Tour, the 2007 Walmart FLW Series, the 2008 Walmart BFL All-American, 2008 TBF National Championship and 2007 Stren Series Championship. Five of the final top 10 anglers qualified through the 2007 Walmart FLW Series, four qualified through the 2008 Walmart FLW Tour and Travis qualified through the 2008 TBF National Championship. David Hudson of Jasper, Ala., won the Co-angler Division and $50,000 Saturday with four bass weighing 7 pounds, 15 ounces followed by Brian Tidwell of Seneca, S.C., in second place with four bass weighing 7-03 worth $10,000. â€œThis feels great,â€� said Hudson, who also won as a co-angler at the National Guard Open at Charlotte, N.C., in April. â€œWords canâ€™t express it really. I get emotional just thinking about it. Hudson relied on a spinning rig and a Red Crawler Berkley Power Finesse Worm Hand Pour. Hudson said he caught fish on the finesse worm in both shallow and deep water. â€œThatâ€™s what Iâ€™m known for,â€� Hudson said. â€œI just try to keep it simple and just catch keepers. Thatâ€™s what I try to do all year long. Hudson opened the tournament in seventh place Thursday with five bass weighing 6-10 while fishing with Team Walmart pro George Cochran of Hot Springs, Ark. On Friday he jumped into fifth place on the strength of a four-bass catch weighing 6-03 while fishing with Team Chevy pro Larry Nixon of Bee Branch, Ark. Hudson sealed the deal Saturday when he fished with Travis. Rounding out the top 10 co-anglers were Chris Hults of Vancleave, Miss. (two bass, 6-07, $9,000); Pat Wilson of Penngrove, Calif. (three bass, 5-14, $8,000); Brandon Hunter of Benton, Ky. (three bass, 4-04, $7,000); Doug Weiser of Springdale, Ark. (two bass, 3-12, $6,000); Todd Lee of Jasper, Ala. (one bass, 3-00, $5,000); Andy Scholz of Reno, Nev. (one bass, 1-05, $4,000); Bill Scharton of Oakdale, Calif. (one bass, 1-02, $3,500) and Teddy Bradley of Mishawaka, Ind. (one bass, 1-00, $3,000). The full field competed in the opening round for 10 slots in Saturdayâ€™s competition based on their two-day accumulated weight. Weights were cleared for day three, and co-angler competition concluded following Saturdayâ€™s weigh-in. The top 10 pros will continue competition Sunday, with the winner determined by the heaviest accumulated weight from days three and four. In Forrest Wood Cup competition, pros and co-anglers are randomly paired each day, with pros supplying the boat, controlling boat movement and competing against other pros. Co-anglers fish from the back deck against other co-anglers. Coverage of the Forrest Wood Cup will be broadcast to 81 million FSN (Fox Sports Net) subscribers in the United States as part of the â€œFLW Outdoorsâ€� television program airing Sept. 28 and Oct. 5. â€œFLW Outdoorsâ€� is also broadcast in Canada on WFN (World Fishing Network) and to more than 429 million households in the United Kingdom, Europe, Russia, Australia, Africa, Asia and the Middle East through a distribution agreement with Matchroom Sport, making it the most widely distributed fishing program in the world. The program airs Sunday mornings at 11 a.m. Eastern time in most markets. Check local listings for times in your area. FLW Outdoors, named after Forrest L. Wood, the legendary founder of Ranger Boats, is the largest fishing tournament organization in the world. In 2008 alone the organization is offering more than 90,000 anglers the chance to win over $40 million through 230 tournaments in 10 circuits. FLW Outdoors is also taking fishing mainstream with the largest prizes and cash awards in the history of fantasy sports, $7.3 million. For more information about FLW Outdoors and its tournaments, visit FLWOutdoors.com or call (270) 252-1000. For more information about FLW Fantasy Fishing, visit FantasyFishing.com. It took all year, but I finally picked a winner!! Great story with Michael being the youngest to ever win etc., but what about his girlfriend being number five overall in Fantasy Fishing. Thursday she will be with the other top 15 down on the FLW stage. She has a real shot at also winning a cool million. She said though that Michael wouldn't let her pick him first so she picked him as coming in second. That might have cost here the million. She has Micheal second and Jay Yelas. Two in the top ten and she's in fifth. Who knows, they may walk away with all the money.